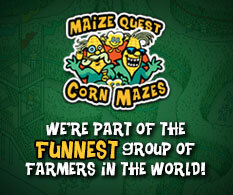 Watch videos of Butcher's Corn Maze and Fun Farm attractions. Fun for the whole family in Newport, PA (located near Harrisburg PA, Carlisle PA and Mechanicsburg PA). Giant Corn Maze, Pumpkin Patch, Snack Shop and picnic area, A-Maze-ing Straw Kingdom, Cow Train, Pedal Tractors and Karts, and other fun and games.